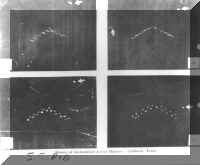 The Lubbock Lights is one of the classic early cases of UFO sightings which received nationwide publicity despite the fact that the mystery was quickly solved – by the very people who first reported it. One night in August 1951, three faculty members of Texas Tech University were watching the sky together and trying to count meteors. Suddenly, they saw 15 to 20 faint, yellowish-white lights moving from north to south. An hour later the spectacle was repeated, and again after another hour. The three scientists estimated the lights to be moving at a height of about 50,000 feet and a speed of about 5 miles per second. Following a call to the Lubbock Evening Avalanche, the story snowballed. However, the three witnesses delved further into the incident and uncovered its true cause – birds. The lights turned out to be nothing more than flocks of migrating plover, reflecting the glow from newly-installed mercury-vapor street lamps. The fact that three professional scientists had so badly misjudged the scale of the phenomenon underscores the difficulties people face in gauging the height and speed of unidentified objects in the sky.